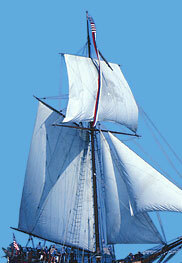 It seems obvious how a sailboat sails downwind: It is pushed along by the wind in its sails. Less obvious is how it can sail upwind or how some sailboats can sail faster than the wind. ©Copyright 2019 Schoolofsailing.com. All rights reserved.